There will be a sweet smell of success at the Royal Welsh Winter Fair (November 28th & 29th) when honey producers take to the Cywain stand in the Food Hall. 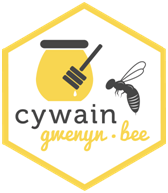 Beekeeping and honey will feature heavily on the Cywain stand with visitors able to try and buy products from different producers on both days of the Fair. It is a boost too for Cywain Bee, an initiative launched two years ago to support Welsh beekeepers and increase honey production and marketing in Wales. Over the two years Cywain Bee Development Manager, Haf Wyn Hughes, has seen interest in Welsh honey brands grow, as well as confidence and recognition of the quality of Welsh honey. Says Haf, “Initially the main focus of Cywain Bee was on mentoring beekeepers and encouraging landowners to house beehives. Since then, the project has been working with beekeepers across Wales looking at ways of boosting beekeeping businesses and raising their confidence in their fantastic products. One such example is Samantha Evans from Maentwrog in Gwynedd who will be testing the concept for her ‘Hallowed Bee’ skin products with Cywain on the first day of the Winter Fair (November 28th). Snowdonia beekeeper Samantha will be raising awareness of her products, which she plans to launch next year with profits from the sales going towards supporting projects to safeguard honeybees. The facial cleanser, toner, moisturiser, serum and scrub are made from bee products including pollen, beeswax, propolis and honey from her own hives as well as botanical based formulas and tinctures she makes from local flowers and plants which she wild harvests. Another producer who will be featured on the Cywain stand is Great Taste Award winner Mêl Cilgwenyn, run by Llangennech beekeepers Richard Jones and Rhodri Owen. The annual awards are recognised as a stamp of excellence among consumers and retailers alike. Mêl Cilgwenyn was among 10,000 products to be judged in this year with its ‘Mêl Cilgwenyn, Pure Carmarthenshire Wildflower Honey’ receiving a coveted award. Richard and Rhodri also run the Bee Free project a charity that uses the skills of beekeeping to help ex-service men and women deal with the effects of Post Traumatic Stress Disorder (PTSD). Himself a former army intelligence officer and PTSD sufferer, Richard found his experience of beekeeping has helped him with the condition. Says Richard, “Having been in some troubled areas I found that over time my mental health was affected by my experiences yet as a hobby beekeeping was helpful and indeed helped me develop coping mechanisms in everyday life. Mêl Cilgwenyn has been supported in a variety of ways by Cywain Bee, and at the Winter Fair Richard and Rhodri will be launching their new labelling and branding and will be bringing their award-winning honey to the stand along with their new ‘Pure Welsh Heather Honey’. Says Rhodri, “Cywain Bee have been very supportive helping us to develop into a bigger and better business with help with branding and label design and offering advice on reaching markets we would not have otherwise reached for with help with selling techniques and a distribution workshop. There are approximately 1,840 members of the Welsh Beekeepers Association (WBKA) and its affiliated organisations spread throughout Wales. Many beekeepers, including Peter Jenkins of Mêl ap Griff, are passionate about the preservation of indigenous Welsh bees (Apis Mellifera Mellifera). Lampeter-based Peter, who inherited his hives of Welsh bees from his father, belongs to the Bee Improvement & Bee Breeders Association (BIBBA) an organisation dedicated to preserving the indigenous British bee. It is a difficult task says Peter, who will be at the Winter Fair launching his honey’s new branding, which was supported by Cywain. “Apis Mellifera Mellifera have evolved over thousands of years to survive and prosper in our fickle climate,” says Peter. The drive to raise awareness of the struggling native Welsh bees will be discussed at a special conference on February 23rd (2017) at the Centre for Alternative Technology in Machynlleth. Case studies of renowned UK honey producers will be featured at the event. Hosted by Cywain Bee the event will also demonstrate how beekeepers and bee farmers (those with more than 40 colonies) might use native bees to their advantage as well as methods of identifying and breeding locally adapted native stocks. The conference builds on a number of successful events, including a seminar at Coleg Sir Gar a few weeks ago. Jointly held between Cywain Bee and Farming Connect the day highlighted how bees increase productivity and benefit biodiversity in existing farm systems and following the day Coleg Sir Gar has plans to work with a local beekeeper. For anyone wishing to find out more about the support available from the Cywain Bee project Haf Hughes will be present on the Cywain stand in the Food Hall on both days of the Winter Fair. Mêl ap Griff will be on the Cywain stand on Monday, November 28th. Mêl Cilgwenyn will be on the Cywain stand on Tuesday, November 29th. Hallowed Bee will be market testing on the Cywain stand on Monday, November 28th.